"I believe that belongs to Mr Gilmore"
Worth upgrading vlsd to kaaz 1.5 way? Hello Blakeo, This is probably the most important part of the question. I can't speak for Kaaz equipment but living with a 1.5 way diff is definitely noticeable. Alot of people say that it is impractical for street, personally I don't really mind but it does get embarrassing when you're carting around the inlaws etc. What annoys me about street driving a locking LSD is the wear when you try to compromise for driving compliance. Wear on tyres, wear on clutch, wear on diff. Power delivery, especially through turns become so much more affirmative than a worn out VLSD. Also you may need to factor in cost of installation and maintenance. Mechanical LSDs need alot more attention than the VLSD - periodic oil changes and eventual rebuilds. First 500km wear in period is quite harsh though. Hope this gives some insight and helps you make a well thought out decision. 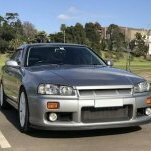 Hello Joe, I'm really keen to know aswell since HKS GT-RS kit for RB25 have been discontinued. I was seriously considering picking up the Tomei Arms due to it being one of the only bolt on turbo kits still available from a Japanese tuning house but read not so promising feedback on the units. Good link, alot of product info. I don't really understand turbo specs. Can someone help interpret the turbine, compressor wheel figures and trim? What is it comparable with Garret catalogue? Their naming convention seems more straight forward. Billet compressor wheels are a good feature but ball bearings are generally more favourable than journals. Hope it turns out to be a ripper turbo though, please tell us how it goes. I don't know why but I can't get enough of these ads! Duriving body des! This vid has a Nissan spokesperson discussing aspects of Sedan, predominantly driving feel and chassis development. Kind of reminds me of how Best Motoring used to interview owners of tune shops. Youtube close caption translate gives a gist of what's being discussed, not amazing though. Nice pics, very interesting break. I'm no expert but it looks like metal fatigue. https://en.wikipedia.org/wiki/Fatigue_(material)#/media/File:Tender_fatigued_axle.JPG If the replaced driveshaft was a used part a contributing factor could be that the unit was repeatedly loaded beyond its intended limit during its lifetime aswell. Similar to when you bend a paper clip at the same point until it eventually snaps. Dark, corroded void near surface looks like it may also be a manufacturing defect but that's just assumption, could be just oil stain. As to why coincidently passenger drive shaft failure may be to do with how the differential is transferring load, similar to how an open differential spins one tyre under certain conditions. May only be far fetched and theoretical but hope this contributes to the discussion. Stanced, a la Penny Farthing. Wow, nice! how does it handle the extreme climate, any issues? RWD platform? Hey all, Stumbled across this short article. https://www.trap.team/news/2018/11/17/nismo-complete-car-catalog Thought it was pretty neat.